Alright, so since the other thread was locked, here is a new one. - Talk about wwe/tna moments, wrestlers, plots, past and present, etc. - No flaming, arguing, fighting, etc. 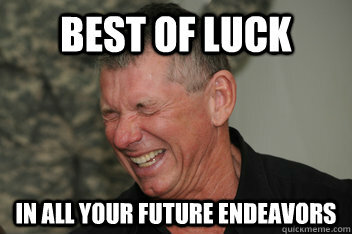 or you will be future endeavored. - Thanks and have a nice day! - Talk about wwe moments, wrestlers, plots, past and present, etc. Uh I don't know what to do since I don't follow WWE. Anything I missed that's major? Ultimate Warrior came back and beat Undertaker at Wrestlemania. So, how about those crazy guys down south? Sounds like Batista. Meh. I like what TNA is delivering every week. It's just more entertaining for me than wwe. Pleasantly surprised at how fast Chris Sabin has risen since his return, but the guy's put in his years to get his much-deserved shine. Hopefully he has himself a strong world title reign. Makes me miss Alex Shelley tho. Now that guy could've been a world champ. And I wish they'd just do away with the Suicide/Manik gimmick already, hell, whatever mystique it had left was flushed down the toilet when they unveiled his identity. Just let TJ Perkins loose as himself. Agreed on Manik but I still like how he handles himself in the ring. I'm sure, somewhere down the road, they will bring back another Manik/Suicide so they can do the stupid plot of there being two. I would love to see Alex Shelly come back and feud with Chris Sabin. Would make for some epic matches. I was like aw... somebody got way off topic and caused a good topic to be locked. I saw some of those posts towards the end. They all have a bunch of different opinions and they all started cursing each other out. This topic better not get locked... So everyone please try to stay on topic and not go way out there... So anyway back on topic, The Wyatts attacked Kane after his match (somehow you know this stuff is going to happen.) John Cena beats Ryback in a tables match. Those were really the only matches I paid attention to. 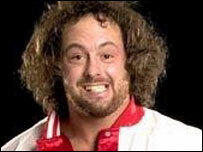 What's this I heard about Daniel Bryan getting a corporate makeover? Daniel Bryan is fine just the way he is. Respect the Beard!!! I think it could work if it's not completely shaved off. The WWE fan who attacked Randy Orton in the ring at Tuesday night's WWE Live Event from Cape Town, South Africa is 20-year-old pro wrestler Tshepo Sekhabi, known in the ring as "Jozi the Wrestling Machine." In an interview with South African news website ENCA.com, Sekhabi claims he quit his job in order to attend the event. The attack was premeditated - and he ended up with a black eye and a swollen face as a result of Randy Orton kicking him in the face as he was being pulled from the ring by security. Contrary to previous reports, Sekhabi was not "formally" arrested but was given a five year ban from the casino resort where the WWE event was being held. "Randy Orton was the victim in this incident and suffered an injured groin." I am all but positive now that TNA's mystery man is Tito Ortiz since he just signed with Bellator. Wouldn't surprise me if he signed a cross promotion deal with TNA at the same time since it's Spike TV. Either way, I guarantee this will be a letdown. Oh btw, since I don't think I made this clear, I hate how Chris Sabin won the TNA championship. He gets squashed for 19 minutes and then he wins via the hammer. If he won clean that would have made it so much better, but I am glad that he is getting the recognition he deserves either way. Yeah, I'll agree with you as far as Chris Sabin winning it on an impact, instead of a ppv, and the way he did it. But that's just like what wwe would do in almost every championship match. So, it shouldn't be anything new.